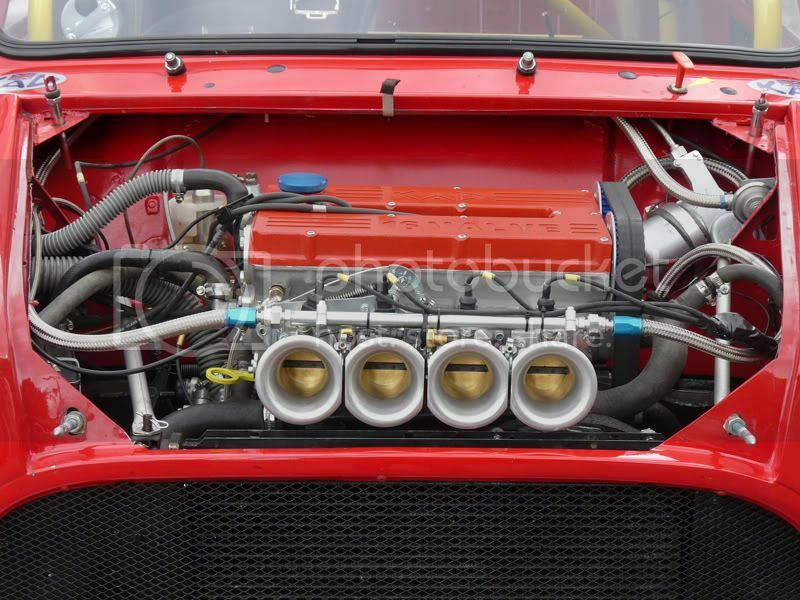 Midas Cars Forum - www.midascarsforum.com • View topic - Midas Bronze new engine time! Midas Bronze new engine time! So i've taken the mini engine out, split it up and its now at morspeed! Now some of you may not be happy that i won't be using the GT engine / box and head, but it will be going in the other midas i have (once rebuilt of course). My mini engine is also far from standard. I'm having it bored to 1330, new pistons bearings and reground crank. I already have a 35mm inlet 31mm outlet cylinder head with bronze valve guides and double springs, but it had never been ported so that's getting done also. A morspeed phase 3 'trackday' cam. Standard pre-verto flywheel, though looking at getting a lightened version. Big HIF44 single carb with fuel-rich needle. Re: Midas Bronze new engine time! Sounds like a nice build James. I hope it works out well with you. Good luck with getting it on time from Morspeed though. I thought he had stopped trading. There's a lot of chatter on the mini forums about poor customer service from there, sadly. I have read things, but a few good friends know him and have used him and been timely and actually quite cheap considering. I'm only 45mins at most from him so can always visit! Thats great you are only 45 mins from him. I understand from what I have read and heard, thats how you will get your stuff. One or two literally camped out until he finished machining off stuff on the same day they got there (after waiting a considerable number of months before hand). From my own experience I was going to sort out a K head kit off him (as his prices seemed ok), but I waiting 6 months and went for a 7 port instead as I was sick of waiting. Thankfully I hadn't parted with any cash. Maybe he's sorted himself out after the recent legal wranglings. I have read the same stories and was a little dubious, but a friend had his engine done in race seaon took 4 weeks, he's quoted 3 to me...so we'll see. Popping down next week to drop off a deposit that he didn't even ask for (just thought it would speed things up) and the timing parts as he'd said he'd time it in for me too! Just been back to morspeed, dropped off a deposit and my timing gear /cam / backplate. Indicating the block has been cross threaded and this repair has been used in its place... all well and good. Until I realised that the plate which the steady uses seems to be broken along its length mounted to the body of the car. To make things worse it looks like with this break it has made the piece shorter and has pushed a hole of the same size into the bodywork. I.e: the plate is broken into a smaller square and pushed / broken the fibreglass directly behind it. Now obviously i cannot use this mount any more, but what are peoples recommendations into fixing/ repairing or utilising another top engine steady? Which mounts to the thermostat then to the body with 3 bolts, is it possible to gain access to under the cross-member part which the top tower bolts mount to? I will take some pictures tomorrow if possible, it's a little head scratching and a bit down-heartening so i'd appreciate the advice! Good news though, i have the exhaust off finally, after attacking it with an angle grinder, removed all the ancillaries the same day. Just got back from the garage tonight and got the engine out, pain in the bloody arse lifting it out the top...but all done, so thats one step closer!